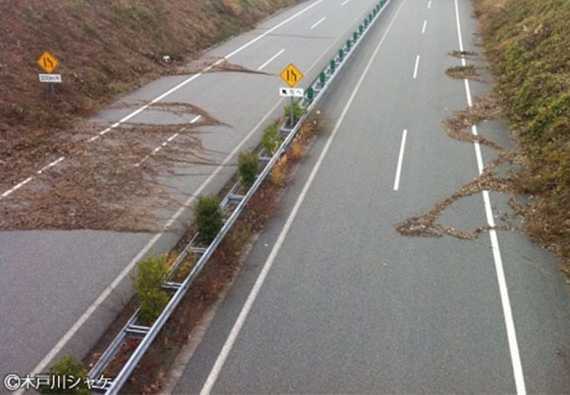 Turning points: in the radioactive evacuation zone near Fukushima, a weed called Common Mullein reclaims Japanese highways. Image Source: Kotaku via ENE News. Kairos was, for Aristotle, the contextual meaning of a time; in the New Testament, it is "the appointed time in the purpose of God," the turning point when the divine apparently intersects with human affairs. That is likely a concept with long, pre-Christian roots. Paul Tillich interpreted Kairoi as moments of crisis when the word of god becomes literal reality. For the non-religious, this is merely a metaphor, but the idea - of the fictional, the fanciful, the imaginative themes of private emotional worlds of faith and introspection suddenly becoming reality - remains sadly familiar. The terrible and shocking transition when the virtual becomes real is a Millennial concern, and applies even more in non-religious terms. 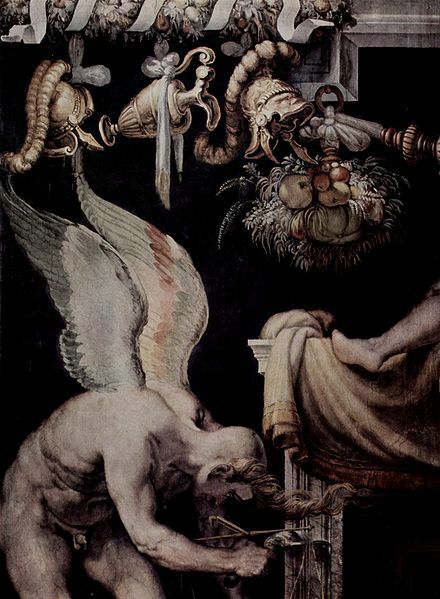 Francesco Salviati, Kairos (1552-1554). Image Source: Wiki. There have been a few uneasy nuclear headlines floating around of late. These invisible threats appeal to the anticipation of kairos, a kind of deep breath before the plunge when the invisible becomes visible, the intangible becomes real, the subjective becomes objective. There was the semi-viral piece on what an atomic bomb sounds like (listen to it here). Most videos of atomic bombs exploding are dubbed with explosion soundtracks from conventional bombs. What makes a nuke even more terrifying is that its explosion is actually relatively quiet. Camera footage of journalists in Japan circulated, which showed them shocked and fearful as they drove in June 2012 through a hot spot near Fukushima (at 6:26 in the video below). Within seconds, the radiation levels jumped from 5 to 500 millirem per hour (mR/h), a suddenly dangerous level of radiation exposure. Thankfully, the car did not break down, and they weren't stranded in the hot spot. Caption for the above video: Ian and Hiroshi enter the exclusion zone, 10km from the damaged nuclear power plant in Fukushima. After traveling down the tsunami-ravaged coast, they drive through the center of Namie town, which was badly damaged in the earthquake. After getting out of the car to measure radiation levels, they are stopped by a police patrol and questioned. Finally, after coming across a herd of cows that roams freely in the exclusion zone, the film crew unknowingly drives directly into a radiation hotspot. NOTE: The radiation measurements are in millirem per hour (mR/h). 1 mR/h equals 10 microsieverts per hour (microSv/h). The top reading of 500 mR/h in the film is equal to 5,000 microSv/h. And yet, in the same week, hair-trigger glitches ran up and down the nuclear industry. Pennsylvania's Limerick One nuclear plant near Philadelphia shut down due to an undetermined explosion. New York's Nine Mile Point Unit One shut down due to a "high neutron flux." And abroad, Sweden's Ringhals Two shut down due to unknown problems. The UK's Sizewell B went into automatic shutdown, due to unspecified causes. Nuclear officials were arrested in South Korea amid reports of bribery and corruption. The nuke plot in Dark Knight matters because Mainstream Media has blacked out the truth about the staggering scope of Fukushima and its historic importance. The Mainstream Media has glossed over the Infinite Harm that the use of nuclear power represents as an industry. We are all collectively living a real life cliffhanger yet in some surreal reality horror genre there are no reports and very few members of the general public are even cognizant. We can all be sure that there definitely is no Hero coming to save us. If our reality could be fictionalized then he weatherman would be reporting radiation readings in a regional format as an extension of Air Quality reports but in our reality from which there is no fade out, there is only silence. Dark Knight matters here on this thread because in the mainstream media vacuum, millions of young people are shown a fictional solution to nuclear power involving a nuclear explosion being placed in the water by the HERO and the fictional masses applauding the HERO's act. Setting off a nuke in the water is not a solution. It is a disaster. Switching back to the movies but forcing the narrative to apply to our current condition on the planet, BANE WON. THE PEOPLE ALL DIE OF CANCER 20 YEARS BEFORE THEY SHOULD while plants and animals become freakish and deformed. Yes, the fiction is fine as entertainment, I enjoyed it, but when in the context of censored real information eerily parallel to the fiction it becomes political. This is a headline because Batman is to America what Godzilla is to Japan. To spread the idea that disposing of nukes in water is an heroic solution on this scale is relevant to ENENEWS. I went to see Dark Knight as a comic book fiend from the 80's and enjoyed it. I did not read into the plot line of Bane before going because I wanted a surprise. Well, when I saw the mushroom cloud over the water I thought, I am going to post this up in enenews because its what is getting mainlined into the pulse of the masses. Use this image to explain the fallacy. " You remember when Batman dropped the nuke in the water? Well that's fine in comic books and movies but did you know in real life it has already happened in Fukushima, Japan and the nukes poisoned Japan, the Pacific ocean, the West Coast of North America and the entire northern Hemisphere." Its an entry point, a common ground culturally on the subject of nukes in water, its political and culturally relevant. On the Web, reality and fiction are fluid, and easily switch places. Incredibly wild Internet conspiracy theories began circulating about Colorado's Dark Knight cinema shooting almost immediately after it happened. This mass murder intensified public fear, and inspired bizarre imaginings. On a forum that 'exposes the dreamworld we believe to be real,' a thread postulates that the shooter is not human. One commenter writes: "There is definitely something going on with the human psyche that we can't quite put our finger on." Conspiracy theorists are weaving mad fictions to try to make sense of an insane reality. And that insane reality was itself a fiction made real by the perpetrator (or perpetrators? so the chatter runs about set-ups and accomplices): a Batman mask was found in the alleged gunman's apartment. Does this mean the gunman debated, Two-Face-like, between becoming Batman or the Joker? There has been a weird trend of late, in which some individuals take cosplay beyond comics conventions. A few months back, another college kid tried to make fiction a reality. But he chose to dress as Batman and patrol his city, and the news outlets laughed it off. Another character, a wealthy anonymous philanthropist likes to dress as Batman and drive around in a Lamborghini. That story went viral. In 2011, a 31-year-old man was arrested armed and dressed as Batman, while dangling from the roof of a building in Michigan. The trend of Millennial literal-mindedness was there. The Dark Knight shooting is a question of relative degree. An ABC exclusive video (see here and here) of James Holmes six years ago showed him attending a prestigious summer science camp at the Salk Institute; he studied the creation of "temporal illusions that allow you to alter the past." He also studied "subjective experience ... what takes place inside the mind" at the Computational Neurobiology Lab under Dr. Terrence Sejnowski and John Jacobson. Sejnowski is known for his work on mapping neural processes onto computational systems and vice versa. In his summer presentation, Holmes referred to Jacobson's work on Grapheme Perception. Looking back on this brief project, Jacobson claimed that Holmes was not brilliant, and turned in unfinished work. There is a conspiracy theory video (here) on the possible impact of temporal illusions on Holmes's actions. You can see Jacobson below explaining how subjective time is different from real time. The distinction between illusion and reality hinges on shifting perceptions of time. Jacobson explains subjective time, illusion and reality. Video Source: Youtube. Whatever Jacobson thought, Holmes went on to win a scholarship, and as the Washington Post put it, planned this attack while surrounded by brain experts, who did not see enough to see this coming. People at the University of Colorado are not talking. Thus, it is not clear if Holmes had an opportunity prior to his PhD comprehensive exams (on which he had not done well, according to anonymous comments from the department at the University of Colorado) to develop a dissertation topic and focus of study. Subjective time for a large contingent of those on the Web dicussing this event could be described as 'impending crisis.' Perhaps it is that anticipated disaster which makes apocalyptic conclusions so neatly slot into this picture. As with 9/11, there is an almost pathological mass resistance in some quarters of America to taking the ugly facts of this horrible crime at face value. Even when it defies decency toward the victims, a corner of the Internet stubbornly contradicts reality. It took four days after the murders before a 'Dark Knight Conspiracy' playlist appeared on Youtube. Conspiracy theorists believe that the Dark Knight crime falls in line with a string of Illuminati rituals, as evil power players progressively drop their masks in their bid to take over the world this year. Rumour-mongers worry that ominous symbols, rampant in popular culture, will connect to some dark disaster at the Olympics and lead to nuclear war. Actors in these tales vary, but they range from the UN, to the American government through their fabled MK Ultra zombie program, to the FBI, to the Freemasons, to the rapper Lil' Wayne. The rapper released a creepy video filled with supposed Illuminati and Masonic symbols (My Homies Still), three days before the Colorado cinema shooting; in the video, Lil' Wayne appears with strange batlike figures and dances in a cinema with 12 skeletons sitting behind him. With these kinds of examples, you can hardly blame Youtubers and Twitter followers for making sense in this way of a sick crime in a hellish society (here, here, here). [N]ote that many people are postulating that THE EVENT will occur at the opening ceremonies, but, for reasons of a 'strange coincidence', it is my opinion that IT will occur on the last day, during the closing ceremonies on August 12, 2012. Part of my reasoning has to do with the curious coincidence of the closing date and the first Hydrogen bomb test in Russia on August 12, 1953. The test was called Joe 4 by the power structure here in the USA. There are some very interesting connections between the players in that drama under Joe Stalin, and recent linguistics out of the CFR (council on foreign relations), and Tavistock** (et al...it has many 'branding agencies'). Of course the conspiracy nutters could be completely correct causing us to all focus our attention on the Zionist gamers in London anxiously awaiting the false flag event...in which case, will they pop it off? Or not? Can the new world orderonians afford to NOT use this particular karios of time for their ritual? In my analysis, i conclude that they have to do it. Even if tens of millions of us are watching, and waiting for it, knowing in advance that it is all lies and mis-direction, i think that this particular moment in time is too precious for them to lose the opportunity. The particular energies and strains in the global control matrix are currently so great that tptb need all their tools just to have a hope of continuation, let alone 'success'. It is this desperate need that has been in our data for years that backs their [fear quotient] around this time in history. It is this [fear] of [loss] that will drive tptb to [desperate measures], which i think will include doing a false flag even though we are all watching, waiting, and talking about it advance. And even knowing that we will all be pointing fingers and raising one hell of a stink afterward, i think that tptb have their nuts in a temporal vise, and MUST do SOMETHING. This is an example of how anxiety about a silent nuclear threat, ramped up by hyper-communications, twists interpretations of agency and responsibility in world affairs. It is a kind of thinking that allows believers to disbelieve reality, and replace it with created meta-unreality. Let us hope that the Olympic coincidence with a nuclear anniversary - to say nothing of the Munich 40th anniversary and a nuclear weapon that went missing (maybe) this year in Germany - do not offer an opportunity for meta-unrealities to thrive.